If you have parchment paper, place a strip, long enough so that it hangs out on each side, in each section of the muffin tin. This will help when you remove the mini pies. 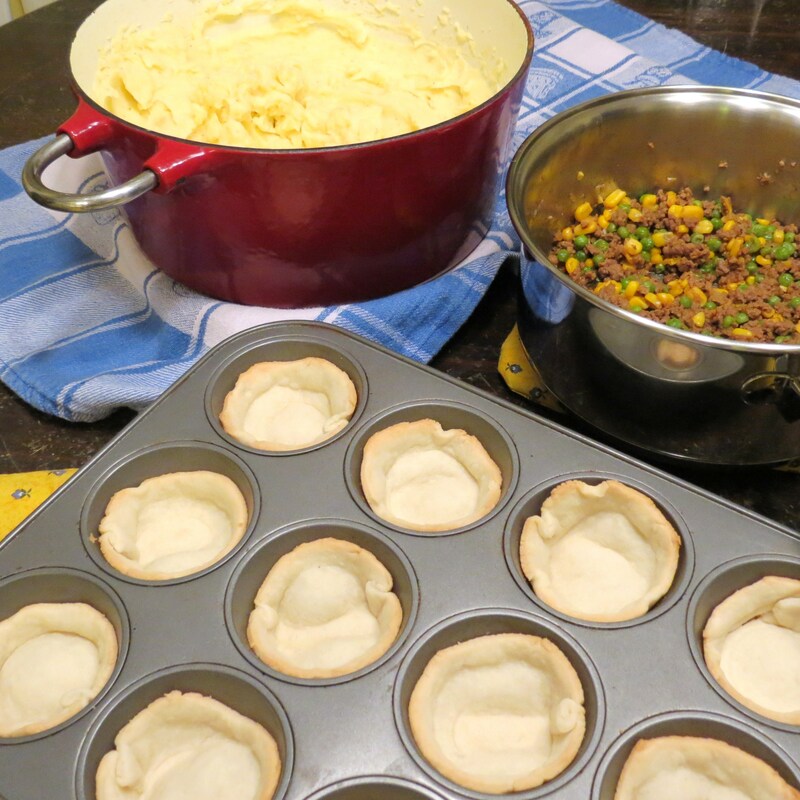 Mini Shepherds Pies are easy to make! The recipe calls for purchased pie crust and – if you’re short on time – a 24 oz. container of ready-to-eat mashed potatoes can be used. Making these mini pies is fun and easy – and so is eating them. 1 Tbs. tomato paste ++ Freeze tomato paste in 1 Tbs. portions in a ziploc bag. 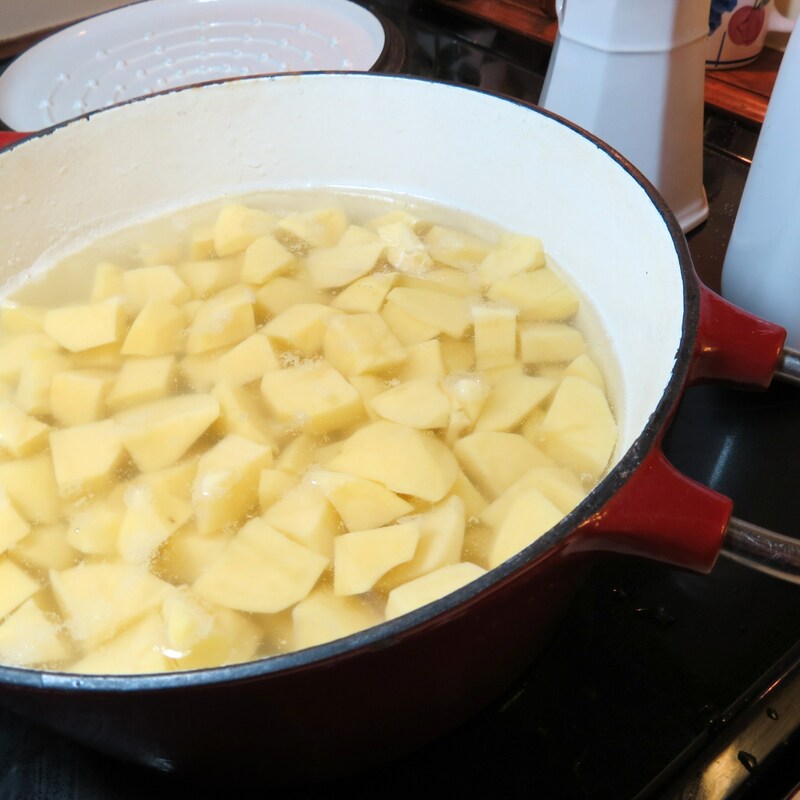 Place 5 cups chopped, peeled Yukon Gold potatoes in a medium-sized saucepan. Add enough cold water to cover. Bring to a boil over medium-high heat. Lower heat and cover saucepan. Allow potatoes to simmer for 25 – 30 minutes or until potatoes can easily be pierced with a sharp knife. ++ It’s better to cook the potatoes longer than end up with lumpy potatoes!! I know – Been There – Done That! While potatoes are cooking, begin beef/veggie filling. Place 1 Tbs. butter In a large non-stick skillet. Add 1/3 cup chopped onion. Cook onions, stirring often, over medium heat until they soften. 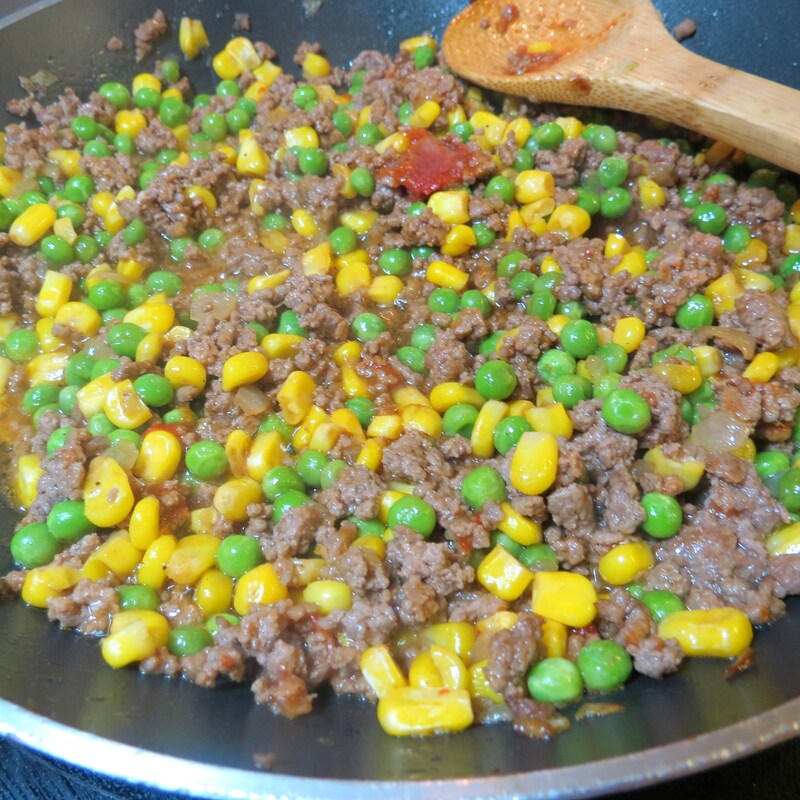 Add 1/2 pound chopped (minced) beef. Continue to cook until beef loses its pink color. ++ Break up any large chunks of beef. ++ Remove any extra grease, although I leave about 2 Tbs. – for the flavor. Add 3/4 cup still-frozen corn and 3/4 cup still-frozen peas, 1/3 cup water, 1 Tbs. tomato paste, 3/4 tsp. salt, 1/3 tsp. pepper and either a chicken or beef bouillon cube. Continue cooking, stirring often, for an additional 4 to 5 minutes… until most of the liquid has been absorbed. Set aside. Now it’s time for the mini-pie crusts. This is fun! ++ Remove the pie crusts from the refrigerator about 15 minutes before so the crusts will be soft enough to work with. Unroll pie crusts. 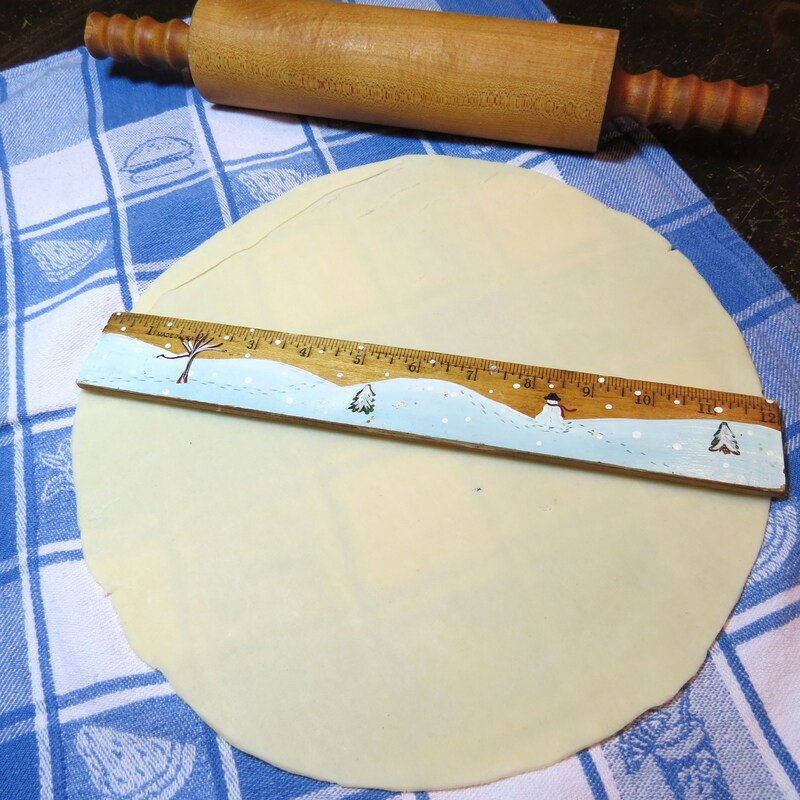 Roll each crust into a 12″ circle, which only takes a second ’cause the crusts are almost that big already. Using a 4″ circle (I used the 4″ top of a plastic food container – or you could use a piece of cardboard) cut out 12 circles. 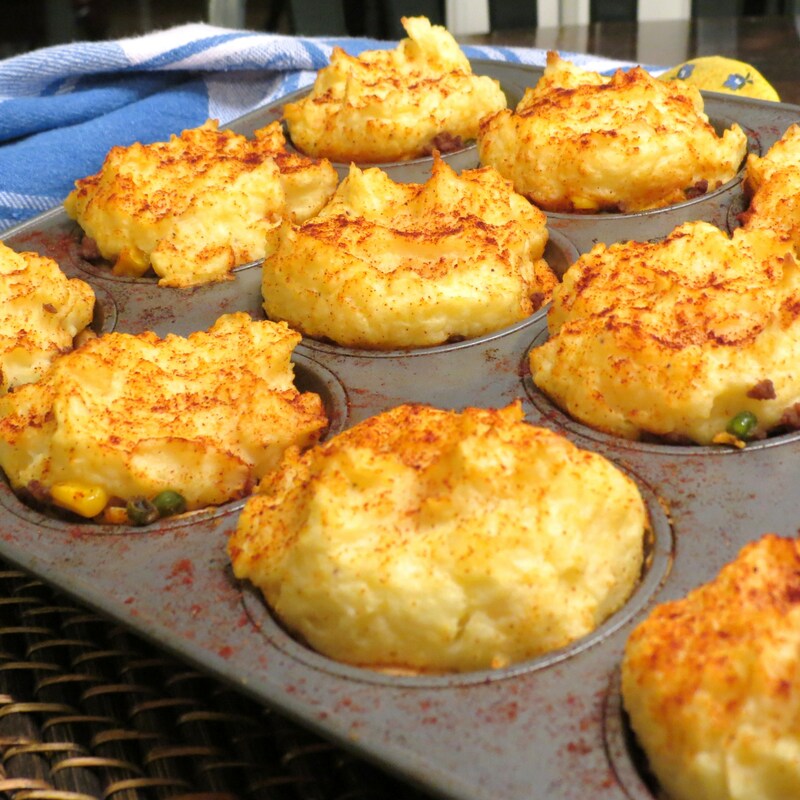 Place one pie crust circle in each of the sections of a 12-cup muffin tin. Gently press pie crust to fit. Bake at 400F for 8 minutes. ++ Lower oven temperature to 350F once you’ve removed muffin tin with bottom crusts from oven. Drain cooked potatoes. Mash down with a potato masher. Add 2 – 3 Tbs. butter, 3/4 tsp. salt, 1/4 tsp. pepper and approximately 1/3 cup milk – or ‘Half ‘n Half‘ – or Single Cream – and beat with a mixer until the potatoes are creamy but still stiff enough to hold their shape on top of the beef filling. Using a 1/4 cup measuring cup, put a portion of the meat/vegetable filling in each section. Top with 1/4 cup mashed potatoes. ++ If you have extra mashed potatoes, add a bit more to each mini-pie. 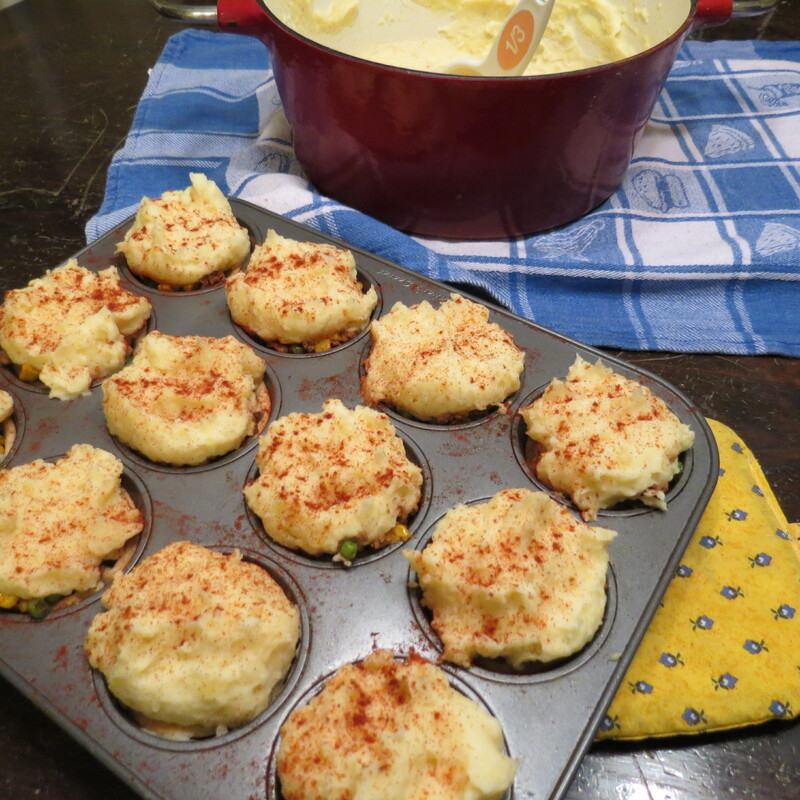 Sprinkle with a bit of paprika to give the Mini Shepherds Pies a bit of color. You know, part of finding a particular food delicious is often due to it’s color, so adding a bit of paprika not only makes things taste better but also gives them better eye-appeal. You can also sprinkle on a bit of cheese! 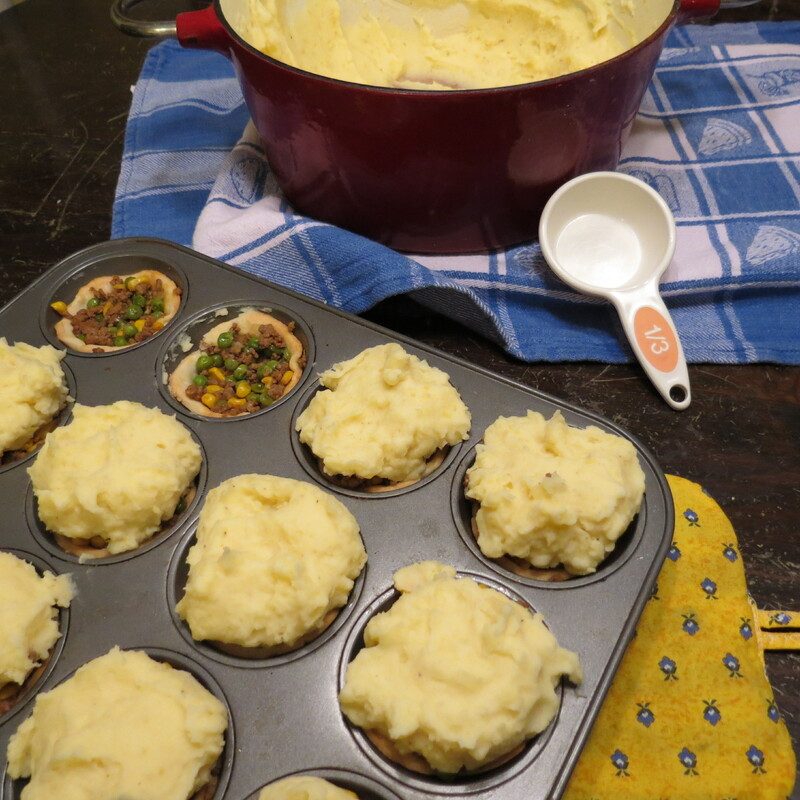 Bake the Mini-Shepherds Pies at 350F for 25 – 30 minutes. Potatoes and crust will be slightly browned. 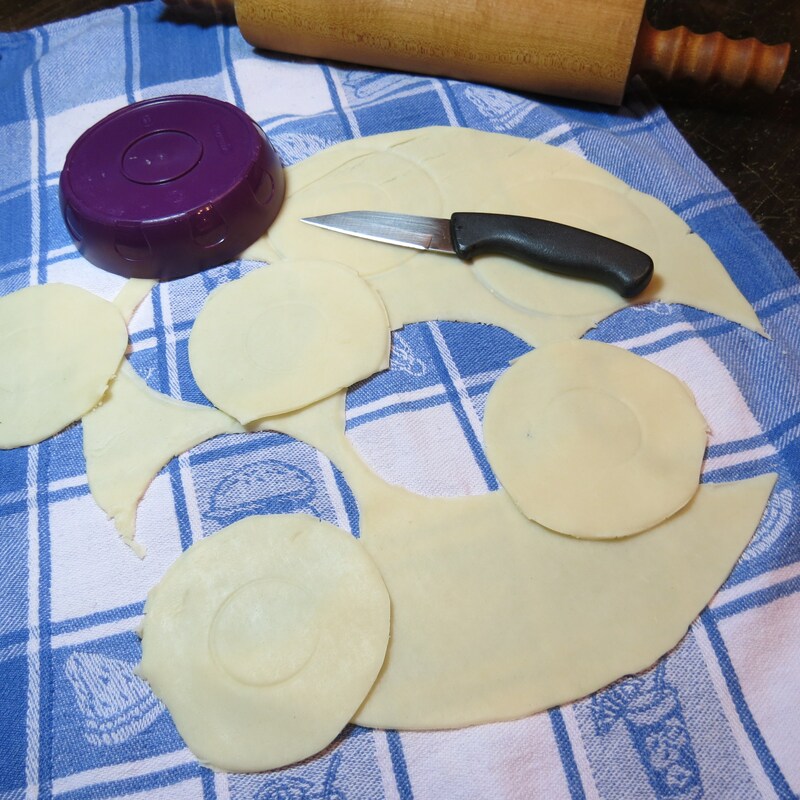 ++ Let stand 10 minutes before serving, which helps the pie crust to not fall apart when you remove the mini-pies. Enjoy !! Did I see that photo or missed it? I have been browsing your blog. Enjoy the week! Those cottage pies make me drool straight away. What a lovely idea to have individual ones. I never really thought I would do that!!! How is spring for you? ours is nice, warm and sunny so far. Have a lovely Sunday!!! My husband would love these tasty pies. I love the idea of freezing tomato paste in small portions. I do it with my chipotle peppers. Thanks for the tip . Thanks for taking the time to comment. And thank YOU for the tip about freezing chipotle peppers! Ooohhh my. How can something look so divine and wicked at the same time? I can’t ask my Canadian family or friends because most of them, being French Canadian, wouldn’t have any idea ! One of the many things I had to get used to the two times we lived in the province of Quebec was the ‘single cream’ and ‘double cream’ etc. thing – – – except, in Canada, they go by percentages.. like ‘12% cream’ or something like that. So I’d be writing down a recipe, for instance, from one of my husband’s aunts… and I’d use both French and English words… and put question marks next to the cream !! My Mom was just tell me about an Irish pub near her home that makes the best Shepherds pie! A mini version would be perfect for her (she has a small appetite) and then I could freeze the rest for her to enjoy later. I’ll be using your recipe this weekend! I’m so pleased to know you’ll be making these for your mom!! Please let me know if you have any questions – or suggestions!! PS I was reminded, a while ago – when I posted a recipe for a ‘regular’ Shepherds Pie – that a true ‘Shepherds Pie’ is make with lamb…. A pie made ground (minced) beef is called a ‘Cottage Pie’. The thing is… here in North America ….. we DO call it a Shepherds Pie – so I’m just sticking with that !! ; o ) PSS I’m not sure if they do the whole ‘Cottage Pie’ VS ‘Shepherds Pie’ in Canada!!?? What fun! And they’re so cute!!! Thanks Mimi – they ARE cute !! ; o ) An old friend of mine, from Rhode Island, is coming to visit in about a week and a half. I’m planning to make regular Shepherds Pie for dinner when he’s here because he has a big appetite – and also because I’m planning to invite some of my husband’s family as well. But I really do love these little pies !! I love that you can use these in a buffet or if you have leftovers, since they’re so portable, throw one into a work lunch. This looks so good! I am going to try this in the near future! Anything with mashed potatoes has got to be good, right!? 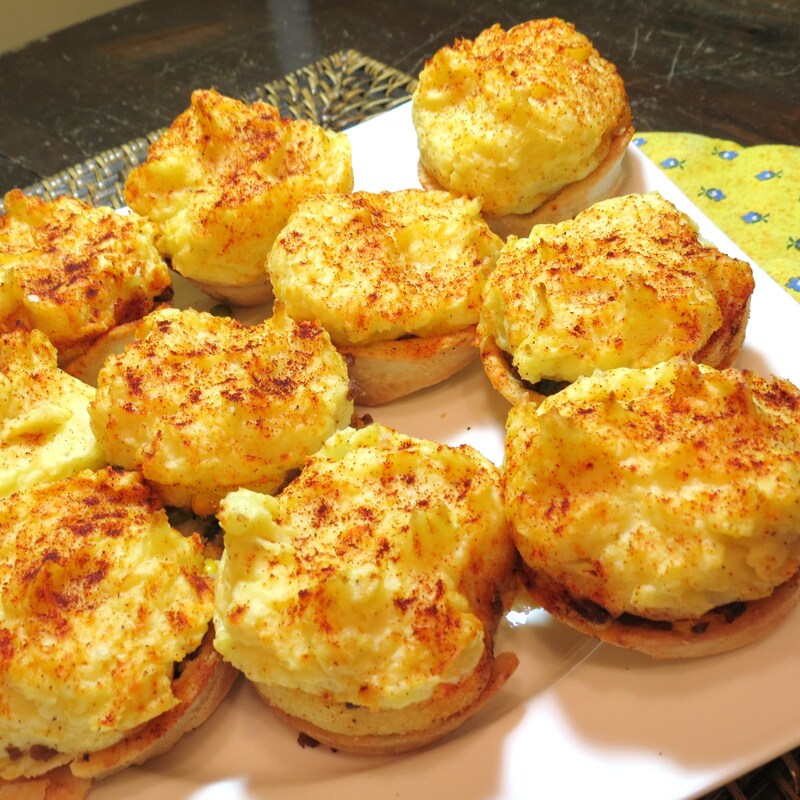 I think you’ll really like these mini-pies – and – you can always add more mashed potatoes on top. 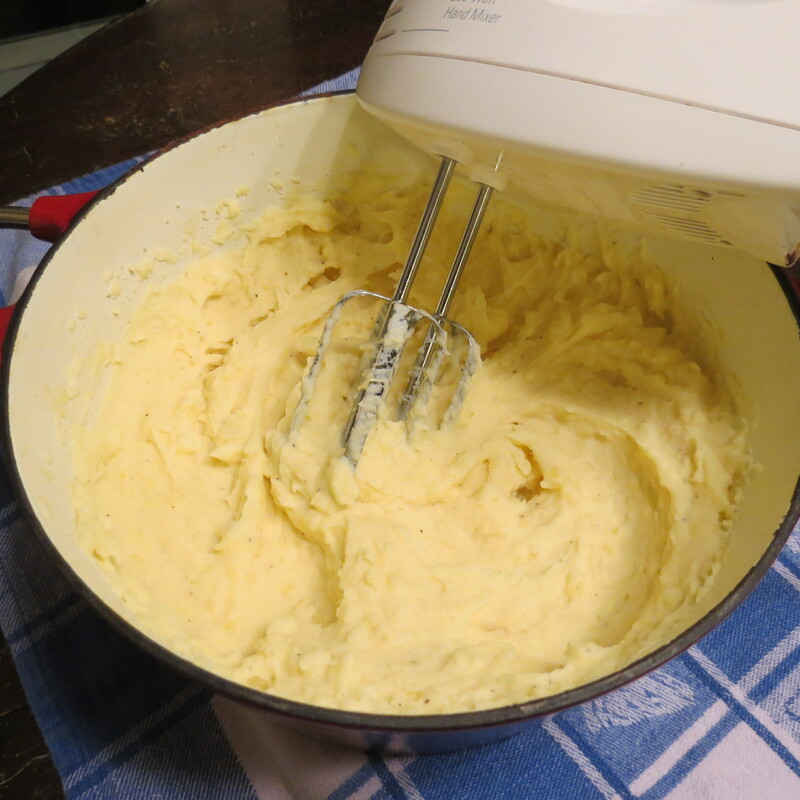 I actually made enough to put 1/3 cup mashed potatoes on top… plus used Half ‘n Half for some extra creaminess!! Let me know if you ever get a chance to try these! !